Today’s post is written by Lisa Kamont, a Charlotte-based health advocate and mother of two. Through the myriad of choices we are all exposed to every day it is no wonder it can be overwhelming to figure out how to eat right. When faced with health challenges we turn to our diet and wonder, what makes sense for me? Should my diet be vegan, vegetarian, gluten free, soy free, dairy free, egg free, nut free, grain free, non GMO….Seriously? What’s left?! When did it become so difficult to just eat? Why are there so many facebook posts and websites telling me I must cut out this or that if I want to live a healthy lifestyle? Which choices are right for my body? My beliefs? And, which are legitimately going to help me to feel better? As Americans, we all want the ONE magical answer and we want it to be cheap and work in under 5 minutes a day! Through my own personal health journey I was initially overwhelmed with finding the precise protocol that followed all of the rules we are bombarded with daily. Then, something occurred to me. I need to take a step back, get back to basics, get to the core of what I need, and take….my…..time. This perspective allowed me to breathe. Plus, it sounded a lot more reasonable than living on organic kale and alkaline water! One of the most basic truths I have learned to remember is that our body is a collection of cells. Every cell needs fuel and the right tools to operate correctly and together. This small ‘city’ in our bodies can either succeed providing us with health and vitality, or fail leading to degenerative disease and illness. Like a small city our bodies need a functioning transportation system to take in the good and dispose of the bad. I found that rather than treating symptoms of cellular dysfunction, as our society tends to do, it was more beneficial to get to the root of the problem. Even when faced with a challenging autoimmune health situation, it has been enlightening to discover the basics of eating right can really be quite simple. I have been able to overcome my health challenges and live pain free with a few critical points in mind that I enjoy sharing with others. – As human beings we all need basic foundational dense nutrients to flourish, and we need them in a form our body can assimilate. With our agricultural soils depleted by 85% (RIO Global Earth Summit), our food supply is scarcely adequate for what our bodies require. Even according to the AMA, we must supplement, and we must find options that are highly absorbable, safe, and nutrient dense. I have found such an option for myself and my family and would not go a day without it. – Gut health is critical. Making a daily habit of nourishing, gut healing foods is extremely impactful. Have you heard about the bone broth craze? It’s good stuff! – Drink water, lots and lots of water. Our bodies are 60% water and we need a means of flushing out the toxins we are exposed to daily as well as maintaining strong muscles and healthy skin. – Get sun, exercise, and rest daily. If you are the Mom of a little one like me you’ll know that the ‘rest’ part doesn’t always happen. Do your best! – I would venture to guess most of us need some additional type of supplementation depending on our personal situation (vitamin D, probiotics, safe antibacterial/viral remedies, essential oils). – I would encourage anyone to seek the support of wellness practitioners such as Wellness Coaches, Chiropractors, Acupuncturists and Integrative resources. These experts are often versed in how our bodies operate at a fundamental level and can guide you in your journey of becoming healthy and balanced. As with anything in life, we get out what we put in. We carefully budget for school, buying a home, utility bills, and retirement. I recall reading a statistic that 2% of Americans budget for health and wellness related activities. For some reason the time and money spent on health (supplements, gym memberships, time to meditate) is often considered an ‘extra’ or a ‘splurge’. However, what is the cost of doing nothing? Will we see that retirement we’ve so faithfully planned ahead for if we don’t indulge in these ‘extras’? If you are feeling overwhelmed with the journey to a healthier you, I encourage anyone to take a step back, get to the core of what your body needs to heal, be patient along the way, and realize it is worth the time and effort to discover a healthier version of yourself. If we can determine the tools our bodies need to prosper, we can begin to feel better at our core, and ideally stop disease before it starts. For anyone interested in a detailed look at how our bodies operate at a cellular level and how this is connected to disease, I recommend the following video by Dr. Gary Tunsky. : What the Cell is Going On – Dr. Gary Tunsky. This past week we had the exciting privilege to be a sponsor for Charlotte Seen’s Fashion Week. Flyers with YWC information went out in all the swag bags and I donated a health coaching package to the silent auction. I’m so proud to be able to help benefit Levine Children’s Hospital and the National Black Child Development Institute as part of the sponsorship package. 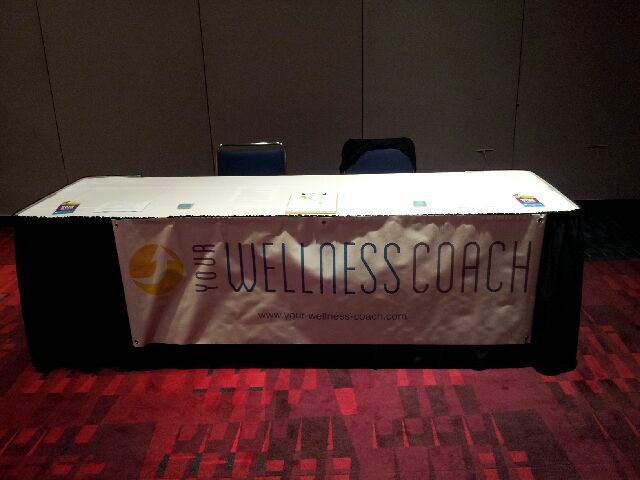 Your Wellness Coach is looking forward to participating next year too!